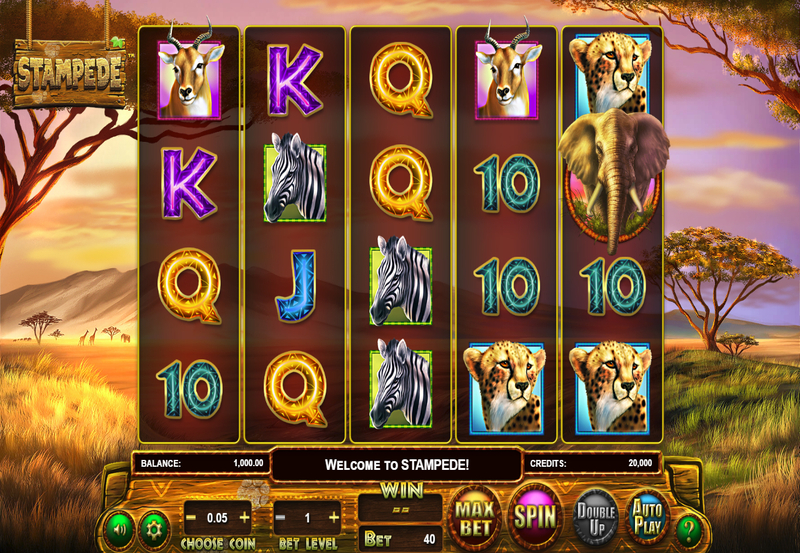 Stampede slot from Betsoft Gaming has been inspired by the wild animals of the Savannah plains. The games 5 reels and 4 rows feature zebras, gazelles, elephants, eagles and cheetahs, as well as typical card symbols. The Elephant is one of the key components in the game and will stampede across the reels should they make up part of a winning combination. 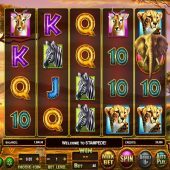 To activate the free spins bonus feature in Stampede you will need to land 3, 4 or 5 tree scatters in any position on the reels. In return you will be rewarded with 8, 12 or 20 free games. The free spins can be re-triggered when 3 or more scatters appear during the feature. The African Savannah has been the theme of many slots over the years, including IGT's The Wildlife, Aristocrats 50 Lions and WMS' Raging Rhino, to name a few. It is certainly one of the more popular themes for video slots, along with Egyptian slots and Irish-inspired games.